Rated 5.0/5 based on 4 customer reviews! Wonderful service, would highly recommend! Chuck was prompt, courteous, and honest in his assessment of our problem. I would recommend him. We had water leaking from our machine all over the floor. Called Borden who, we have used before on a refrigerator, came out and Chuck quickly diagnosed the problem. He ordered the part we needed and when it came in he promptly replaced the ailing piece. he saved us a lot of money buy suggesting we repair instead of replace the machine. Thanks Borden/ Chuck. we will be using your expertise, if needed, in the future. Our Customers Say: "Fast and reliable service at a fair price!" 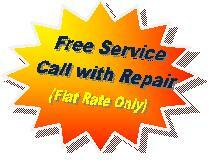 Request Service in Pottstown, Pennsylvania and the Surrounding Areas For All Your Appliance Repair Needs.